Prominent & Leading Service Provider from Pune, we offer biological safety cabinets, airmagik air shower, airmagik isolation room, airmagik mini pleat hepa filters, airmagik modular dry room and hepa filters. A biosafety cabinet (BSC)—also called a biological safety cabinet or microbiological safety cabinet—is an enclosed, ventilated laboratory workspace for safely working with materials contaminated with (or potentially contaminated with) pathogens requiring a defined biosafety level. Airmagik’s Biological Safety Cabinets protect what’s valuable providing personnel, product and/or environmental protection when looking to obtain optimum control over product quality while reducing the potential for exposure. Ergonomic Biosafety Cabinet design improves laboratory safety practices and process accuracy. Air Showers are used to remove contaminate off personnel and equipment as they enter a clean environment or exit a contaminated environment. Air showers also create a protective barrier between the clean and contaminated areas. ASPT offers a wide variety of sizes and construction materials in order to offer the most customized and affordable product for each individual need. If you are unsure of what type of Air Shower you may need for your particular project please check out our Air Shower Questionnaire. Note: Air Showers are shipped knock down and require some basic assembly. 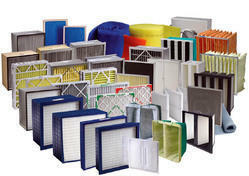 Air filtration HEPA filters, etc. An isolation facility aims to control the airflow in the room so that the number of airborne infectious particles is reduced to a level that ensures cross-infection of other people within a healthcare facility is highly unlikely. 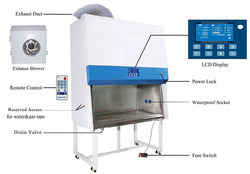 Control of the quantity and quality of intake or exhaust air. Maintain different air pressures between adjacent areas. Designing airflow patterns for specific clinical procedures. Diluting infectious particles with large air volumes. Air filtration – HEPA filters, etc. 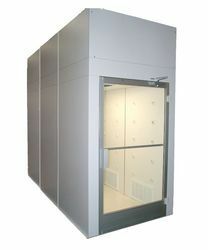 Negative room air pressure with additional barriers including an Anteroom, also known as Class Q for quarantine isolation. 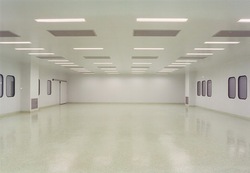 Isolation rooms have fairly high rates of air exchange relative to other patient areas. This applies to both ventilation air supply and exhaust flow rates. Potential draughts within the patient room can result, therefore thermal comfort of the patient needs special attention. Consideration should be given to installing individual thermostats in each room so that air temperature and relative humidity can be controlled from within the room. Our MINI PLEAT extended surface self-supported mini pleat filters are designed for use in air filtration systems and equipment where medium to high efficiency filtration is required. Available in a wide variety of standard sizes and nominal 2” & 4” depths, our MINI PLEAT provides optimal performance in variable air volume systems. The injection molded polypropylene frame and thermally bonded polypropylene media separators provide strength and rigidity to this product. The media pack, comprised of non-shedding, gradient density polypropylene fibers, is bonded to the inside perimeter of the enclosure frame by a moisture resistant adhesive, providing a continuous and positive seal. The all synthetic composition of frame, media pack and separators are not adversely affected by moisture and do not support the growth of microbial organisms such as bacteria, mold and fungi, etc. The standard offering is rated by Underwriters Laboratories as Class II, per UL Standard 900. Rigid construction, extended surface, low initial pressure drop measured in inches e.g., long service life, savings in energy costs and shipping costs are features and benefits which make our MINI PLEAT an excellent option for meeting the requirements of medium to high efficiency filtration. These filters are made from water resistant, fire retardant, imported micro fine glass fibre media. Designed to accommodate higher airflow volume, these filters are used for laminar flow benches, bio safety cabinets, dispensing booths and as terminal filters in cleanroom applications. 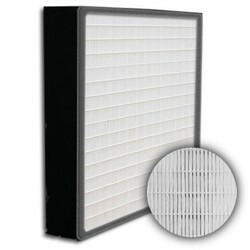 The mini-pleat filter design configuration increases a HEPA filter's energy efficiency. The aluminium separators that give the filter media support are eliminated, thus reducing pressure drop. The mini-pleat filter works best with an air velocity of 250-300 fpm, which is desirable for energy-efficient design but is low compared to conventional rules of thumb. Airmagikdryrooms feature designs for precise, continuous, low dew point and temperature control for any moisture sensitive application that you require. Our modular, insulated Airmagik dryrooms are now the standard in many industries, where we’ve engineered many Airmagik dryrooms to custom specifications. We’ll utilize all of our experience and accumulated knowledge for your project, working closely with you, from the engineering and design phase to building your Airmagik dryroom through installation. All Airmagik dryroom construction is performed by our own factorytrained personnel and we offer turnkey project management to assure that your custom Airmagik dryroom will perform safely, within your requirements, and at top levels of efficiency. 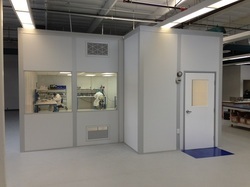 The components of our modular cleanrooms are the perfect solution for your Airmagik dryroom needs. The concepts that we have perfected over the last 30+ years effectively create the required elements of your Airmagik dryroom. Please call us to discuss your specific requirements so that we may work with you to provide you a cost-effective solution to your Airmagik dryrooms needs. Tehcpanacea’s Airmagik HEPA filters are designed to arrest very fine particles effectively, but they do not filter out gasses and odor molecules. Circumstances requiring filtration of volatile organic compounds, chemical vapors, cigarette, pet, and/or flatulence odors call for the use of an activated carbon (charcoal) or other type of filter instead of or in addition to a HEPA filter. HEPA filters are composed of a mat of randomly arranged fibres. The fibres are typically composed of fiberglass and possess diameters between 0.5 and 2.0 micrometres. Key factors affecting its functions are fibre diameter, filter thickness, and face velocity. The air space between HEPA filter fibres is typically much greater than 0.3 μm. where particles following a line of flow in the air stream come within one radius of a fibre and adhere to it. where larger particles are unable to avoid fibres by following the curving contours of the air stream and are forced to embed in one of them directly; this effect increases with diminishing fibre separation and higher air flow velocity. an enhancing mechanism that is a result of the collision with gas molecules by the smallest particles, especially those below 0.1 µm in diameter, which are thereby impeded and delayed in their path through the filter; this behaviour is similar to Brownian motion and raises the probability that a particle will be stopped by either of the two mechanisms above; this mechanism becomes dominant at lower air flow velocities. Diffusion predominates below the 0.1 μm diameter particle size. Impaction and interception predominate above 0.4 μm. In between, near the most penetrating particle size (MPPS) 0.21 μm, both diffusion and interception are comparatively inefficient. Illumination 750 - 800 lumen. Modular Operating Theatre System consist of Air filtration system consisting of HEPA filters Plenum (laminar Air flow), PUFF wall panels, ceiling panels, interior doors and windows. The System is designed for operating theatres, treatment rooms and rooms in which high sanitary and hygienic standards are required. 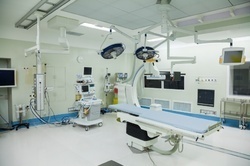 Techpanacea’s Airmagik - Modular OT has rich experience of in designing and fabrication more than 120 World Class Modular Operation Theatre across India. Modular OT offers the advantage of speedy construction, high-quality finishes in a prevention of contamination build up, long durability, robust and flexibility design for future expansion, ease of maintenance etc. The pre-engineered modular Operation Theatre solves the problem of infections. A continuous flow of highly filtered 'bacteria-free' air is reticulated under positive pressure into the operating field and air contaminants generated during surgery are removed from the site. With anti-bacterial paint has minimum durability of 15 years. Vapour permeability (allows substrate moisture to escape) protects against growth of bacteria, meld and yeasts. Structural Insulated Panels (SIPs for short) are a highly durable type of building material with excellent thermal performance. The compact, flat panels are made by sandwiching together different, composite materials to create a product that is robust and air-tight, thus providing superior insulation. Being lightweight, Structural Insulated Panels can be put together to create the walls, floor and roof of a modular building off-site before being transported to their final location. · Thermal performance. The composition of a SIP means that it is exceptionally air-tight, providing excellent insulation to your building. Rooms built using SIPs will feel warmer and take less energy to heat. · Compact and lightweight. Structural Insulated Panels are thin and compact, so they take up less space than regular walls. That means you can get the most out of the space available to you, freeing up extra room within your interior that would normally be taken up by thicker walls. · Environmentally friendly. The superior insulation properties of Structural Insulated Panels mean that they are an excellent choice for the environment. With virtually no heat lost through the air-tight panels, the use of SIPs makes for an energy efficient building that minimises waste. · Resistant to damp and cold. Buildings made from timber or other traditional materials may be susceptible to problems such as compression shrinkage (where wood shrinks in humid conditions) and cold bridging (where a poorly insulated part of the building lets in the cold and increases the likelihood of condensation). Buildings constructed from Structural Insulated Panels are immune to these issues. · Highly suited to off-site construction. In contrast to more traditional building materials, Structural Insulated Panels can be put together off-site. Because they are lightweight they can be transported after the main construction work has already been done, and installed at their intended site only when the building is almost complete. (> 0.5mm) are suitable for pharmaceutical projects. Graphite-reinforced plastic (GRP) sheet can be used in corrosive chemical processing areas and also in food-processing zones.